The hot dog enjoys an outsized reputation among pre-cooked, tubed meats. Vienna sausages are peak divorced-dad food, and no one’s excited for Lit’l Smokies unless they’re wrapped in pastry dough or smothered in a mix of chili sauce and grape jelly. But hot dogs, despite being functionally the same, are something most of us actively look forward to at cookouts and sporting events. And while unquestionably delicious, hot dogs are about the lowest-effort food you can “cook”: tubular extrusions of smashed bovine bootyholes that don’t technically require any cooking at all. There’s a reason many a harried mom opts to pop hot dogs in the microwave, plate them with heated-up canned green beans, and call it dinner. They’re easy, and no one’s complaining. But I’m arguing you should spiral cut your hot dogs, and inject at least a quantum of effort into an otherwise effort-free dish (“dish”). It takes all of 30 seconds per dog, and besides looking cool you’ll also significantly improve the hot-dog-eating experience. The process couldn’t be simpler. Hold a sharp paring knife in your dominant hand, and nuzzle it up to the side of the hot dog (starting at the top) at roughly a 45-degree angle. Using the thumb of your knife hand to keep the hot dog firmly-yet-gently pressed to the blade, twist the hot dog with your other hand. It’s pretty easy to cut deeper than needed, but provided the angle of the cut is sharp enough and you don’t bisect the dog, the hot dog should start to kind of screw-tap itself. When you’re finished it won’t look like you’ve done much of anything, but the magic hasn’t started yet. That happens once the hot dog hits the heat. Ordinarily, a ripped or misshapen hot dog is a sign you’ve overcooked it with too-high heat. But thanks to the spiral cut, that can’t happen. Instead, as the casing heats and contracts, it draws the spiral out, creating a stunning, gourmet visual effect. It’s cool-looking, yes, but the advantages extend beyond aesthetics. For one, spiraling makes the meat tubes cook a lot faster, which is a pretty attractive trait for something that’s technically already cooked. But more importantly, it significantly boosts the hot dog’s surface area. And not only is there more surface, but that surface is that much more receptive to slippery condiments like mustard or [stares daggers] ketchup. Lookit that thing! You could fit an entire oil drum of chili and cheese on that hot dog, if you wanted to—and I do. I’m not mad at the extra-crispy edges, either. Seriously, do this for your next backyard cookout. 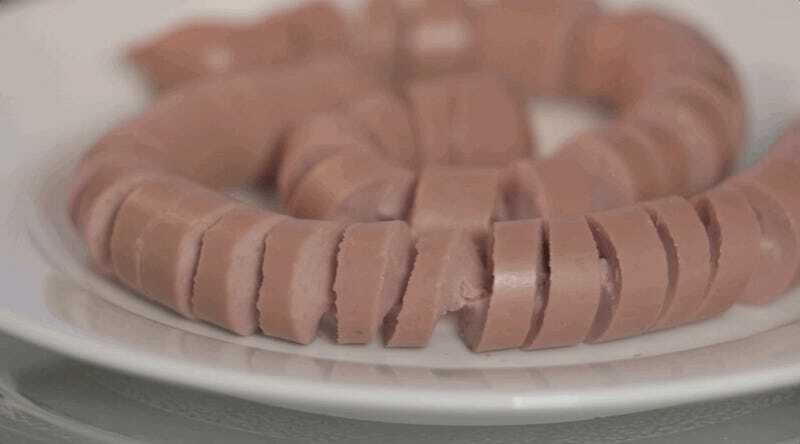 You can spiral a whole pack of hot dogs in a matter of minutes, and you’ll pick up the nuances of the technique—to the extent that there can be nuances in a “technique” that applies to hot dogs—faster than you think. Just be sure to make a few extra to throw at that one guy who always demands his hot dogs be burnt to hell.